Belief in the Bible as God’s authoritative revelation to humanity forms the bedrock of the Christian faith, laying the groundwork for nearly everything in the practice of theology. For the last 150 years or so, this doctrine has been put under the microscope of the modern age, with focused attention-and criticism-falling on three main subject areas: the authority of Scripture, the sufficiency of Scripture, and the interpretation of Scripture. 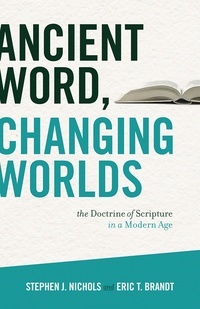 Ancient Word, Changing Worlds tells the story of these developments in the doctrine of Scripture in the modern age, combining in one volume both narrative chapters and chapters devoted to primary source materials. This new genre of historical theology will appeal to general readers, who will be drawn in by the book’s prose style, and students, who will benefit from features like timelines, charts, explanations of key terms, and introductions and explanatory notes for the primary source documents.